Recreational Vehicle Burns in Putnam's Landing, LIVINGSTON, November 27, 2008 - A recreational vehicle parked on the side of the road at 234 Starr Street in the Putnam's Landing Subdivision caught fire and completely burned. The fire was reported shortly before 3 am by a neighbor who spotted the burning vehicle owned by Mark Hagan, 46, of Livingston. Polk County Sheriff's Deputy Darrin Crow was dispatched to the scene and the Livingston Volunteer Fire Department and the Scenic Loop Volunteer Fire Department. According to Hagan, he ran an extension cord to the RV from his house to power up the refrigerator in the RV. It is not yet known if the fire was caused by a faulty connection from the extension cord, or if it is something completely different. The RV did have filled propane tanks inside and they blew up. The fire fighters managed to get the fire completely extinguished by 3:45 am, but not before the RV was completely totaled. Fortunately, nobody was injured during the fire. 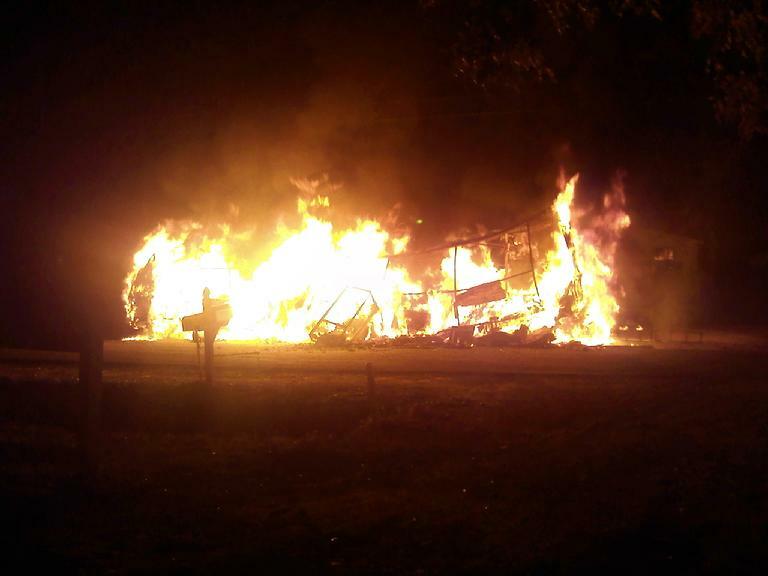 This photo, taken by a bystander with a cell phone, shows the RV when it was engulfed in flames.